Picture yourself returning home to the garden grounds of Springs at Canterfield. Our park-inspired community boasts impressive interiors complemented by top-of-the-line amenities. With studio, one, two, and three bedroom West Dundee, IL, apartments for rent, you can choose your ideal space from our selection of expansive floor plans. In addition to the spacious layout, our townhome-style apartments offer gorgeous hardwood-style floors and tall 9’ ceilings, creating an open and airy atmosphere. In the summer, our shimmering outdoor swimming pool is the place to be. With a peaceful sundeck and sparkling waters, you can relax and recharge. Springs at Canterfield can also help you stay in shape with the deluxe cardio equipment and free weights in our state-of-the-art 24-hour fitness center. Reserve your luxury living space at Springs at Canterfield today. 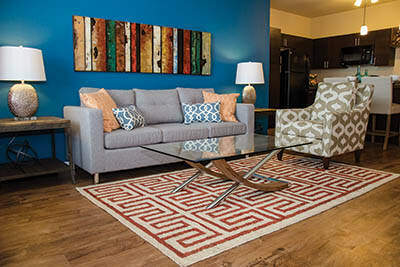 Give us a call to set up your tour of our West Dundee, IL, apartments for rent near Judson University.